My dream holiday to Italy was worth ever penny. I cannot thank hubby dear enough for organizing the trip. It was the first time we booked the whole tour through Cosmos, and what a wonderful experience. Organized tours have advantages and disadvantages, but the advantages definitely outweigh the disadvantages as age creeps up on us. We met people from different cultural backgrounds, different countries and maybe some may develop into friendship.During our daily briefings, everyone complained about having to get up really early, but next day everyone would be on the bus 5 minutes earlier all eager to discover Italy through the eyes of our ever smiling and friendly tour leader and our very capable and careful driver. Italy is all about cararra marble, duomos, prosecco, olives, sculptures, history, fiats and vespas. Our friends and family ask us which was our favourite place. Its such a difficult question to answer as each place we visited had its own beauty and charm. The colourful homes in Burano or the Colesseum, how can one choose? I must admit you may get to read a lot more about the trip in the forth coming postings. I never imagined I would miss salad so much during our 13 day trip. We got salad at very few places where we dined. Mostly, a slice of tomato, a few lettuce leaves, julienne of pepper used a decor was all we got. If we ever got proper salad, mostly everyone on our table would have a heapful on their plate. From a vegetarians point of view, Italian cuisine can be full of carbs. Pizzas and pastas with hardly any topping and sauces barely clinging to the pasta! When others got chicken, fish or meat as their main course, I was usually served cold grilled zucchini (3-4 slices), a big slice of grilled eggplant and a grilled half pepper. When I got back home and noticed in my diary that I still had to work with my two secret ingredients tomato and wheat,(shh cooking secretly challenge) given to me by Nirmala Gurunathan, the initial plan was to make a bread or paratha. However, the craving for salad made me change my mind and I made mini taco salad cups.Even a simple salad of lettuce, carrot and tomato is so appealing at the moment. I do so believe that our bodies crave for different types of foods. At the moment mine is craving for salads. Sift flours, salt and baking powder together into a bowl. Add water and form a soft pliable dough. The dough should not be too hard or sticky. Heat a tawa or frying pan over low heat. Divide the dough into 5 parts. If necessary using little flour, dust the board and roll the ball into a circle of about 8 to 9 inches in diameter. Put the rolled tortilla onto the tawa. Cook on both sides lightly. Put the tortilla in a clean kitchen towel and fold it. Repeat steps 7 to 10 using rest of the dough. Add onion and stir fry till they are soft. Add red pepper and garlic. Stir fry till they are soft. Mix well. Cover and let the sauce simmer over low heat till the water evaporates and the sauce becomes thick. Add salt, pepper, chilli powder, sugar, vinegar and coriander. Mix well. Take 12 muffin cups or tray. Rub oil lightly. Take a 4 inch cookie cutter and cut 12 circles from the tortillas. Place each circle in the cup and press it down gently. Add some baking beans or rice (kidney beans or chickpeas). This is to hold the cups in shape while baking. Bake the cups for 8 to 10 minutes. After 8 minutes, keep an eye on them so that they do not burn. You want a nice golden brown colour. Remove the cups from the tray. Remove the cooking beans and place the cups on a wire rack to cool down. Peel the avocado. Remove the seed. Chop one half of the avocado. Add lemon juice and oil. Mix well. Add rest of the salad ingredients. Mix well. Put about a heaped tablespoon of the salad in each cup. Add a few strands of cheese. Top with a bit of the salsa sauce. I found it difficult to cut the tortilla with the cutter, So I placed the cutter and ran a sharp pointed knife around it. You can prepare the cups using store bought tortillas. I added cumin powder to the tortilla flour. Add flaxseeds, sesame seeds, or dried herbs if you like. Can add salad leaves, olives, bell pepper etc to the salad. Do you sometimes get a badge of beans that don’t cook too well? Don’t throw the away, use them for blind baking. Blind baking is where a pastry has to be baked without a filling. Beans or rice are used to maintain the shape of the pastry and prevent bubbles from forming on the pastry. Those salad cups is just torturing me, so tempting and droolworthy. G'day! These look delish and very creative indeed! 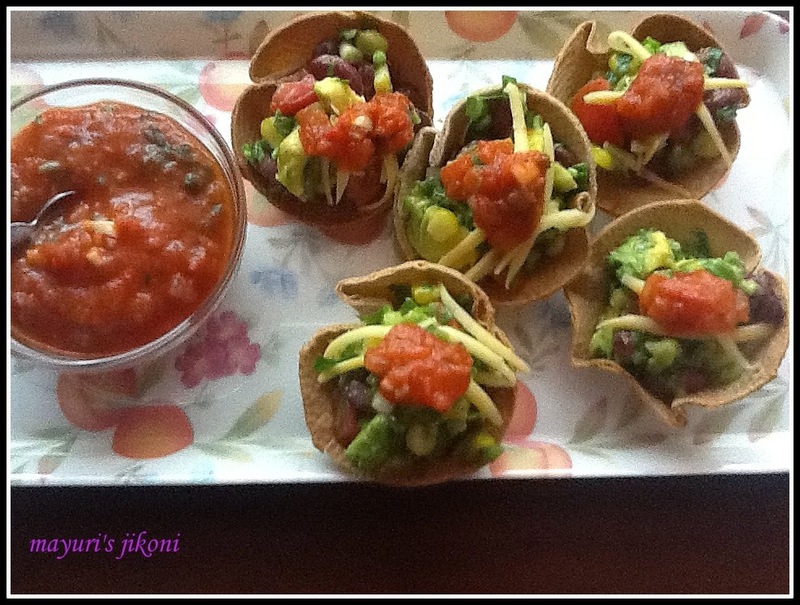 I love the idea of these mini taco bowls,they would make great party appetisers.